New fashion silver tone costume jewelry Indian handmade earring with matching maang tikka studded with high quality CZ AD, rhinestones and simulated dangling beads. 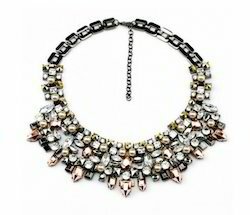 We offer a wide variety of Black Beaded Necklaces in the category of Rhinestone Necklace. They can be used as a gift item and are being offered at the best rates in the industry. We are among the reckoned names in the industry, offering extensive range of quality assured fashion rhinestone necklaces. these products are skillfully designed by expert professionals who have in-depth knowledge in their concerned domain. Our entire product range is in compliance with international standards of quality. Shine like a star! This rhinestone earring and necklace set embellished with shimmering crystal stones, frames your face with brilliant classic and elegant glamour. Accentuate your look with this twinkling style that is both urban chic and Hollywood glam.